Ricki is the heroine’s stage name, and Bonnie is her given name. Ricki left her husband and children in the Midwest years ago to pursue an L.A. rock star’s life. She frontwomans a band called The Flash, and she’s the lead singer, with sometime-boyfriend Greg (Rick Springfield, a revelation here). We hear a lot of both names, Ricki and Bonnie, especially after Ricki’s ex-husband Pete (the always-great Kevin Kline, reuniting with Streep after co-starring with her in 1982’s Sophie’s Choice and 2006’s A Prairie Home Companion) puts in a call to ask Ricki to return to Indiana. Daughter Julie (Mamie Gummer, Streep’s real-life daughter) has been jilted weeks before her wedding, and she’s in bad shape. Gummer is excellent as a dejected daughter and fiancée, and she’s less than thrilled to see her long-absent mom. Eventually, Ricki and Julie begin to bond, but it’s not a forced cliché, one of the few times the script really surprised me. Meanwhile, Ricki has two sons to contend with as well. Joshua (Sebastian Stan, Captain America: The Winter Soldier) is refined young man with an uptight fiancée. Adam (Nick Westrate) is an angry young gay man, and he comes across as such a bitter little queen, I’m astonished the script made it into production without revisions. It’s a distracting flaw in the film, and though the character mellows a little, I rolled my eyes and immediately wanted this character omitted from the story. How Cody has not developed any insight or proficiency in writing gay characters is beyond me. The wounds of Ricki’s absence/abandonment eventually begin to heal, and it is clear Pete may have some unresolved feelings for “Linda.” This is tastefully handled, and I especially liked the character of his current wife, Maureen (Broadway royalty Audra McDonald, who so good on television’s Private Practice). In fact, Maureen confronts Ricki in one of the film’s most persuasive and effective scenes. This is just a guess, but it looks like Demme and Cody were inspired by Streep’s brief but powerhouse scene with Viola Davis is 2008’s Doubt. The Doubt scene was much-applauded, and it won Davis an Oscar nomination (and Streep was nominated, of course). Ricki and the Flash is not unlike Cody’s previous efforts, which veer from uneven (Juno) to pointless and unlikable (Young Adult). Ricki is closer to Juno, because in spite of all the times the writing doesn’t click, the strong scenes more than picks up the slack. In addition to the Streep/McDonald Big Scene, I especially liked the sweet interaction between Ricki and Greg. Another testament to Demme: he has elicited a wonderfully nuanced performance from ’80s icon Springfield. This film is neither sappy nor overplayed; rather, it is surprisingly realistic and identifiable. I’m going out on a limb to wonder if a man were to leave his family in the hands of the mother [in order to pursue his dreams], would he be demonized as a pariah the way Ricki appears to be? Truthfully, yes and no. Especially when you throw a gay son into the mix as one of his offspring. I have known more than my fair share of grown men (gay and straight) with Daddy Issues. So while there is a feminist slant here, Cody nails it without doing so in a heavy-handed manner. There’s no sexism here, just a wonderful albeit imperfect story about family and forgiveness. It turns out Ricki is probably Cody’s best screenplay to date (the Academy agreed with me on Young Adult, and it was rightfully shut out of the Oscar nominations). Sadly, Ricki will not reap the same financial or critical rewards as Juno, which grossed over $140 million at the U.S. box office. In addition to Cody’s Oscar, the film was nominated for three other Oscars: Best Picture, Best Director (Jason Reitman), and Best Actress (Ellen Page). Streep is every bit qualified to score another Best Actress nod here. We know she can sing Broadway (Into the Woods) and country (Postcards from the Edge). We know she play the violin (Music of the Heart). But who knew she could master a guitar-playing would-be rock singer [of a certain age]? In fact, I think Streep is undersinging here, just to show why Ricki never made it “big.” That’s the majesty in a Meryl Streep performance. Her brilliance is capturing the small but crucial details hidden beneath the surface – observations that often go unnoticed in a first viewing. Streep is a total smash in this role, and while it should never be a surprise to watch an award-caliber performance from her – it blows my mind that a 66-year-old actress is still reinventing herself, 38 years after her film debut (in 1977’s Julia). 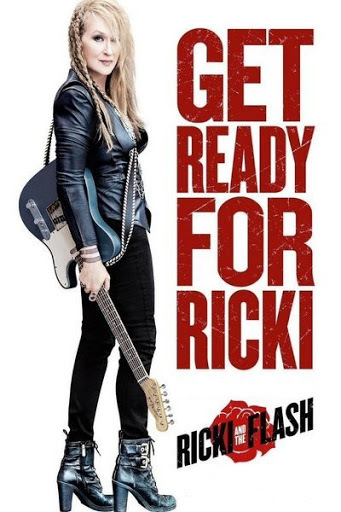 Ricki and the Flash is a warm and enjoyable film, despite some holes in the script. And for me, any trip to the cinema in which Meryl Streep is the starring attraction is more than worth some quibbles.